FC ST.PAULI! A FOOTBALL SPECIAL OR SPECIAL FOOTBALL? special guest post on FC St Pauli from the editor of the fantastic ‘This Drinking Life’ web-zine. Fußball-Club St. Pauli was founded on the 15th of May 1910, based in the lively St Pauli quarter of Hamburg, an area known for its docks, its left-wing activism and for the infamous neon-lit strip clubs of the ‘Reeperbahn’, Europe’s largest red light district. Nicknamed the ‘Brothel of the League’, the club represents the dockers, punks, prostitutes, anarchists, and all the rest who live and toil in the city’s working-class St Pauli enclave. The club is widely recognised for its distinctive left-wing culture and has a large popular following as one of the country’s ‘Kult’ clubs. Before the Eighties, St Pauli was just your regular lower-league club averaging crowds of less than 2000, and living in the shadows of their hated neighbours, HSV Hamburg. It was in the mid-1980s that St. Pauli’s conversion from a traditional club into a ‘Kult’ club began. With Nazis and hooligans ruling the terraces all over Germany, St Pauli was seen as an alternative. Through the local dockyard losing workers and the district falling into dereliction, squatters, artists, anarchists, prostitutes, students, punks and other alternative types all flocked into the district to fill the void. And they started going to the football! 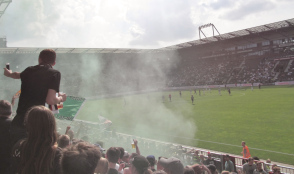 FC St Pauli suddenly became swamped, with the terraces of their old dilapidated Millerntor Stadium full of the disenfranchised roaring out anti-fascist and anti-capitalist chants. But unlike other teams, St Pauli embraced them reveling in its new found ‘underdog’ status. By the late 1990s they were frequently selling out their entire 20,000-capacity ground. 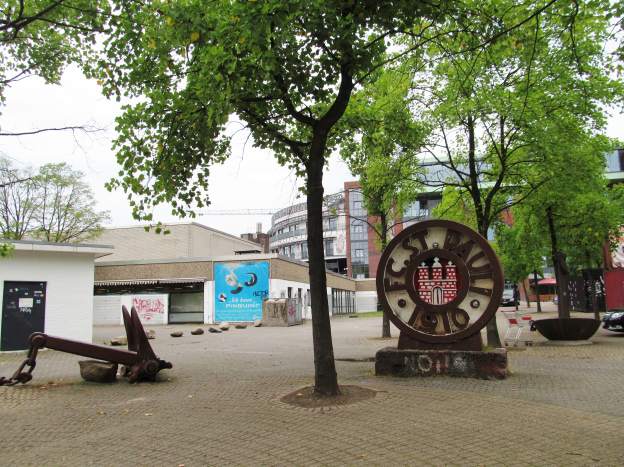 The Skull and Crossbones (the Jolly Roger flag) is a symbol which had long been associated with the district of St Pauli on account of legendary pirate Klaus Störtebeker and his statue. It became the club’s unofficial emblem. The emblem first appearing after a few squatters from the docks brought it onto the terraces. The idea stuck and now it’s very closely connected to the club and the area. You will see the emblem pretty much everywhere in the district, from every corner and on every street. So it’s no surprise to learn that the German media like to call the club the ‘Die Freibeuter der Liga’ (‘Buccaneers of the League’). For a team with such a huge following, their on the field exploits are nothing to write home about. With a virtually empty trophy cabinet and a team that’s regularly seen mid table in Germany’s Bundesliga 2, it’s quite amazing that they have such support at all. A stint in the top tier in 2002, saw them finish a distant last after winning only a handful of games and the resulting relegation nearly bankrupt the club. That relegation led to another worse demotion down into the less-lucrative Regionaliga Nord (III), where they remained for four years. These two relegations, back to back, almost killed St. Pauli. With the club almost bankrupt, the supporters began its fund-raising activities. They printed t-shirts with the club’s crest surrounded by the word Retter (rescuer) with well over a 100,000 sold. They also organized a benefit match against perennial German champions, Bayern Munich, and staged fundraising events such as ‘Drink for St Pauli’, with local publicans donating 50 per cent from each beer sold. Their efforts to save the club worked and also furthered strengthened the bond between club and fan. The club could not survive without its special fans. In 2007, St. Pauli were promoted back to the 2. Bundesliga and in 2010, FC St. Pauli clinched promotion to the 1.Bundesliga, made even sweeter given that 2010 was the club’s centenary. But that also didn’t last too long, and for the 2013–14 season they were again playing back in 2. Bundesliga. One reason for their lack of on field success is that St Pauli sees itself as something more than just a football team. It has certain responsibilities to its fans and to the ethos of the club. Lucrative player contracts and huge corporate revenue streams are frowned upon, with many fans preferring to remain a small club that can be run within their control rather than a large one beholden to forces outside their neighborhood. They are very unusual in that many of their fans didn’t get too irate when they were relegated. For most St. Pauli fans only one thing is important: to remain as true to its progressive principles as possible. 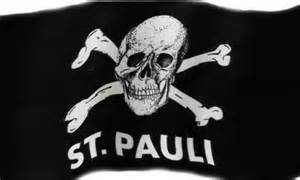 St. Pauli is a way of life, and just like in life, you have your ups and downs. Win, lose or draw, there will always be a St Pauli to support. Still though it can be a challenge. This leaves the club with an obvious financial disadvantage. On the one hand staying loyal to your roots and culture while on the other hand be competitive as a professional sports club and trying to hit the heady heights of top class football. It’s a hard balance. Small reforms had to be made, if anything to save the club from going bust again. There are now VIP seats at the stadium, and the club shop sells as much expensive merchandise as any club on match days. But the soul of the club is still intact with some of the alternative fans from the Eighties now running the club and occupying senior positions on the board. The club is in safe hands. The home venue of FC St Pauli is the Millerntor- Stadium, in the heart of the St Pauli district. The very old style stadium has a capacity of 29,000 with the club getting higher attendances than most Bundesliga 2 teams. The stands are basic, with a concrete and unaesthetic feel. It gets as real as this, it’s not the Emirates or the new Wembley. Supporters, like in a lot of clubs in Germany, have standing room only areas, beer is allowed onto the terraces, and shouting obscenities at the ref is expected! This is a throwback to the good old days of football: beer (Astra, naturally), football and dodgy haircuts (that would be the punks!). ‘Hells Bells’ by AC/DC, greets the teams on their arrival onto the pitch and every home goal is celebrated with ‘Song 2’ by Blur. After consultation with the fans, it was decided that the club would never sell the naming rights of their stadium. Take note Mike Ashley and his ‘SportsDirect.com@StJamesPark’. It’s also important to stress that St. Pauli have more season ticket holders than many Bundesliga teams, proving that fans can be loyal if their wishes are respected, even when the team is not a success on the pitch. Visitors to St. Pauli are assured of having a good time, as long as they share the same ethos of the club and its supporters. 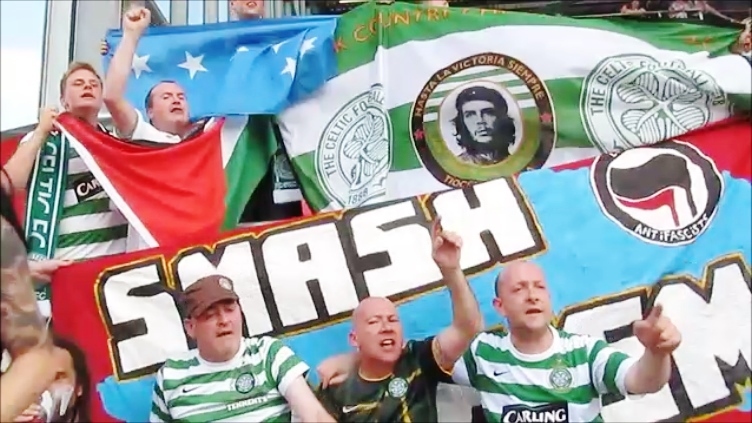 Most supporters have a politically left-wing stance and regard themselves as anti-racist, anti-fascist, anti-homophobic and anti-sexist, and this has brought them into conflict with neo-Nazis and hooligans at away games, and also the boys in blue on occasion. The fans have also been active. 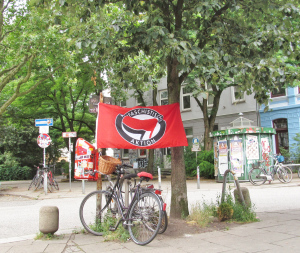 They organise charity events, protest on local issues, and have also set up the Alerta anti-fascist network, a collection of football supporter groups from all over Europe.The club has also taken the step to incorporate a set of Fundamental Principles (Leitlinien) to decree how the club is to be run. The Leitlinien not only reflects what happens on the pitch, but also takes into account their social and political responsibility in relation to the district and the people who live there. One recent report estimated that the team has roughly 11 million fans throughout Germany and the wider world, making the club one of the most widely recognised Bundesliga sides out there. The club boasts roughly 600 worldwide supporters’ groups’, and that support seems to be growing all the time. the legendary supporter’s-owned bar near the stadium. 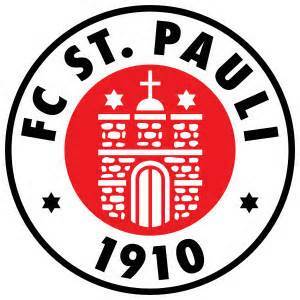 Founded by St. Pauli Fans for St. Pauli Fans. It’s a non-profit enterprise with all monies going into supporters projects. It’s located at Budapester Straße across the road from the Millerntor stadium and a 5 minutes’ walk (or 10 depending on how many Astra’s consumed) from the Reeperbahn. Not so sure of the opening times, but when I was there there was a little crowd waiting for it to open at 8.00 in the morning. But don’t worry the small shop beside sells the Astra Red Light which was 6.0% vol. for 2 euros (3 Euros in the JR! ), and you can easily sit outside on the bench awaiting for it to open. Really liked the bar, the staff were ultra-friendly, and the bar had a nice chilled out vibe going on. Around match time the bar is the place to be, before and after the game, and at night it can get very crowded. 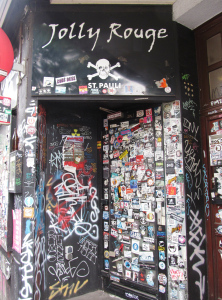 A small place, very easy to pass, but when I was there I had a great time, lots of singing, some very generous locals who bought me a few schnapps, and the landlady, who appeared to be a little gruff, but was in fact very cool, and gave me a few old style St Pauli stickers. Friendly and convivial. Another top class bar, really enjoyed my few days of drinking in this establishment. The staff were really chilled, great fun, and always up for a bit of a talk, some even hanging round after their work shift. Plays some good music and the owner is very friendly and chatty. Recommended. for more London based St Pauli stuff then check out our good mates at the London St Pauli Supporters Club. They have a web site here and a lively facebook group here. Theres also supporters clubs in Yorkshire and Brighton.